Timber merchants, joinery manufacturers and their architectural clients will benefit from a powerful opportunity to boost their knowledge and network with their industry colleagues at the most important event on the UK construction calendar dedicated exclusively to building with wood. Taking place between 9 and 11 October 2018, Timber Expo, supported by content partner TRADA, will join Build Show, Building Tech Live, Civils Expo, Energy 2018, Plant & Machinery Live, HVAC 2018 and the Surface & Materials Show to form UK Construction Week (UKCW), the UK’s largest trade show for the built environment. “Timber Expo consists of three days brimming with the latest products, innovations and developments across the timber sector both within the UK and internationally. The Timber Focus Theatre, supported by TRADA, returns again this year and will have a more interactive feel including a 3D engineered art installation created with students who are pushing the boundaries of what is possible with wood. Arup, Foster and Partners and DRMM are some of the big names making up the seminar programme. Topics to be covered include the specification and regulatory requirements for timber cladding and timber fire doors, building timber buildings as high as a tree, and designing CLT for durability, as well as a number of aspirational timber building case studies. Chat show debates will also take place at the Timber Focus Theatre at various times throughout the event, including provocative discussions on how best to prepare design students for the world of practice. A new feature this year is the Confederation of Timber Industries (CTI) workshops. The Structural Timber Association, Timber Trade Federation, Trussed Rafter Association and British Woodworking Federation will deliver a programme filled with CPD workshops and networking events, supported by the timber industry’s campaign, Wood for Good. Timber Expo will also be linking with the Offsite area within the Build Show. With so much potential around this method of construction, it will be a must-visit area. Other benefits for visitors include an extensive programme of free CPD sessions, the Beer & Ale Festival with hot food and live entertainment, and a chance to celebrate with the Construction Enquirer Awards. Visitors to last year’s show had a combined purchasing power of £75 billion, with 85% of attendees having direct purchasing authority. They included 3,771 professionals from architectural and design firms, more than 3,000 contractors and 7,651 housebuilders and developers. If you want to share your latest product launch or service or just want a platform that gets you directly in front of your customers, there’s still a chance to grab an exhibitor spot. Register your interest via the Timber Expo exhibitors page. 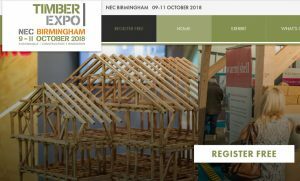 Keep up-to-date about the latest exhibitors, product launches, industry awards and speakers at Timber Expo on the website www.timber-expo.co.uk and on Twitter at @TimberExpo or tweet using #TimberExpo2018. Issued on behalf of UK Construction Week (UKCW) by Liz Male Consulting Ltd.